Trading in stock markets has become an important part of the business world these days. As far as the fundraising of the companies is concerned, the only thing the companies look forward to is going public and trading their shares in the stock market. Therefore, with the increase in the stock market trading, the use of DEMAT accounts has also taken a step forward. But do you ever wonder where to open a Demat account? We have an answer for that too. Trading in securities and stocks is risky and thus, you need to have your account at a place which is fully trustworthy and reliable and India based Angel Broking firm fulfills all that. Angel Broking, as you all might have heard, is the most popular Indian Stock Broking firm that came into existence in 1987. Now, what is a DEMAT account? Well, a Demat or dematerialized account is the one that secures and holds the shares in electronic form. This lets you get carefree of holding shares in paper form. This process has advanced with time along with the setting up of NSE and the standardization of share trading transactions. Also, with the advancement of the internet and digital technology, online trading got a hype and thus, these services came into existence. Before 1997, when the Demat account was nowhere used, the stocks and shares were issued and traded in physical paper form, which is quite obviously a far difficult method of keeping records. Gradually, as the trend of share market trading increased, people also realized the need for a service like Demat account. Instead of taking physical possession of certificates, the investors now have their records secured in the Demat account where they can transact easily and conveniently without making any use of the paperwork. So now you know why the security and safety of your stock market trading are important. Therefore, choosing the best is a necessity. Demat Accounts on Angel Broking come with a lot of advantages which also provide you with the facility of investing conveniently and earning better. Angel Broking is one of the most valued and well-known stockbroking companies in India. It is a member of the Bombay Stock Exchange (BSE), National Stock Exchange (NSE), National Commodity & Derivatives Exchange Limited (NCDEX) and Multi Commodity Exchange of India Limited (MCX). Talking about the details, the company has 8500+ sub-brokers and franchisee outlets in more than 900 cities across India. In 2014, Angel Broking was awarded the BSE-IPF D&B Equity Broking Award for ‘Broking House with Largest Distribution Network’. Apart from this, it has won other awards too over the years. All these facts clearly convey why you should go for Angel Broking while thinking of opening a demat account. But, this is not it. There are a lot more advantages of it. 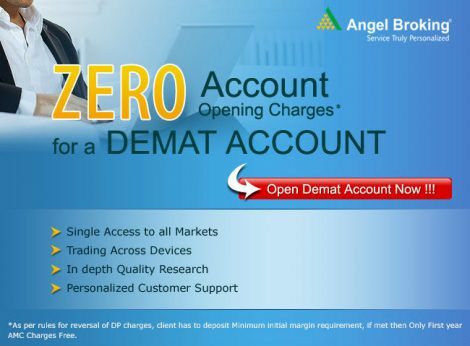 Why to open Demat Account with Angel Broking? – Apart from all the above-mentioned details, there are other facts that you should look into before opening a Demat account and Angel Broking caters to all those while offering various benefits. – Firstly, you reduce a lot of paperwork while ensuring the security of your stock market details and transactions. The electronic way of handling your investments eliminates all the risk of physical documentation. – You save a lot of time because all your problems and investments are perfectly handled by the company. – You can invest in a more proper and easier way and in return get better earnings. Also, there is a better chance of earning higher returns with ARQ. – You can enjoy the award-winning Angel Broking App. This mobile trading app lets you enjoy simple, speedy & secure stock trading experience with its smarter mobile trading software. – The most important feature of Angel Broking is that opening a Demat account takes no time. The account opening process is very short and you can start trading in an hour. – The Angel Broking Demat accounts are speedy and highly secure to keep track of shares which also provide quick settlements. – The Demat account is available on Angel Broking ever since it has been launched that is from 1997. The time duration proves how trustworthy the company is. – The Demat accounts on Angel Broking are all technology enabled and thus, are highly efficient. – The investors receive the credit in his Demat account much quicker than other companies. -The company’s Angel Broking mobile app was downloaded more than 850,000 and more than 450,000 downloads of Angel BEE app. Talking about the success of Angel Broking, the company has won a number of awards, among which the latest one was BSE-IPF D&B Equity Broking Award for ‘Broking House with Largest Distribution Network’ in 2014. Also, it has got the BSE IPF-D&B Equity Broking Award for ‘Best Retail Broking House’ in 2012. Apart from this, the company has been titled with an end number of awards and recognition and stands tall with all these appreciation. It enjoys the reputation of being one of the most respected ‘Retail Broking House’ in the country, with its presence in around 900+ cities. It has a strong heritage that spans around two decades. The firm has enhanced client engagement and experience through the application of technology to all its services, that includes the launch of the mobile application for broking services. The basic purpose of Angel Broking is to ensure client satisfaction through the implementation of advanced technology and digitization. It also has a considerable market share in the cash and commodity segment and has a highly experienced management team and execution strength. Its objective is also to offer the best value for money to investors through various innovative products, investment strategies, advanced technology, and personalized service. The motto of the company is to have complete harmony between quality in process and continuous improvement to deliver exceptional service that will benefit our clients. Angel Broking currently has a network of more than 11,000 sub-brokers. The company has crossed 850,000 downloads of our Angel Broking mobile app and more than 450,000 downloads of Angel BEE app, that enables the company’s clients to make use of the services digitally. Also, through a network of 110 branches and sub-broker, we have pan-India presence in over 1,800 cities and towns.